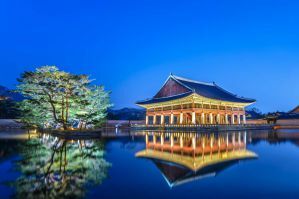 Seoul is the capital of South Korea. It's been growing in popularity in recent years as a tourist destination and it offers visitors a wonderful cultural and culinary experience. It's interesting to see the blending of ancient tradition with modern technology. There are plenty of food vendors, nightlife venues, and religious centers that are all worth exploring. Dongdaemun Market is in the Jung district, which is part of the historic core of Seoul, Korea. There is plenty of shopping in this area and it's a very popular district during evenings and on weekends. This district also houses Seoul Station and Namsan Mountain, where you'll find the Seoul Tower. Dongdaemun is actually in the eastern part of the district. How much do hostels in Seoul cost? This is a favorite hostel of travelers to Seoul. It's close to many of the city's popular attractions and there are two subway lines just a minute away. It's also only a ten minute was from Dongdaemun Market. There is internet access available to guests for free. Each room has a shower, toilet, air conditioning, and television. The staff is friendly and helpful and they can help you with any questions you may have. Do take note that breakfast is not provide and there is no kitchen available to guests. It's a fun place to stay though and you'll likely meet some other guests. This hotel is in a great location just 250 meters from Dongdaemun Market. It's also very close to Cheonggyecheon Stream, Dongdaemun Plaza, Insadong, and Myeongdong. It's conveniently close to Dongdaemun Subway Station and and is within one kilometer of 6 different subway lines. It is near an airport bus stop so you can easily reach the airport upon your departure. The staff work hard to make sure you feel comfortable at the hotel. The rooms are kept clean and the furnishings are modern. You can choose between single, twin, and double rooms. Other amenities available to guests include an internet center and a laundry room. In each room there is cable television, an electric kettle, toiletries and more. This hostel works hard to make sure that travelers are comfortable and relaxed during their time here. The atmosphere is welcoming and the prices are good. Amenities include air conditioning, a kitchen, a community room, a heating system, television, microwave oven, a barbecue area, a cafe, and more. The hostel is conveniently located in the middle of Seoul near Dongdaemun. There are many different tourist attractions nearby. There are also many restaurants and entertainment venues within a short walk.